Athleta CMO Andréa Mallard Gets Real About the Myth of “Work-Life Balance” | Gap Inc.
Athleta Chief Marketing Officer Andréa Mallard’s enthusiasm for new experiences in every area of her life means that even before she joined Athleta in 2017, she was living its mission of empowering herself and other women to realize their limitless potential. Mallard earned a master’s degree from the London School of Economics; worked as a journalist and brand strategist; became an expert in (and speaker about) product innovation and design thinking; and has lived and worked in Paris, London, Toronto, San Francisco, New York, Boston, and Munich. Now, she makes her home in the Bay Area with her husband and three children. 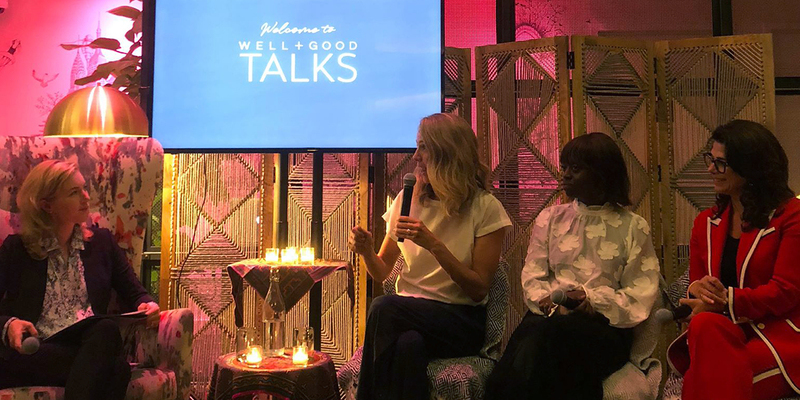 She talked about the myth of work-life balance, staying focused and creating a healthy culture at work as part of a panel in New York City last week hosted by wellness publication Well+Good, where she joined the CEO of J.P. Morgan’s U.S. Private Bank and the founder of the WIE women’s leadership network. Read on for a few of her thoughts. How do you balance a high-powered career with raising a family? You don’t. You decide what matters most to you on a given day and optimize for that. First day of school? Family wins. Important board meeting? Work wins. Overwhelmed with stress? I give myself permission to pause so that I can win. Over the weeks, months, and years, there is balance. It just may not show up on a particular day. How do you stay patient and focused when you are just starting out in your career? Remind yourself that you are training for distance, not for speed. A big mistake 20-somethings make (myself included) is thinking they already need to know who they want to be when they grow up. Forget that. I still don’t know. But I decided to try on as many hats as possible along the way, knowing that every job, no matter how specific, gives you transferable skills. Your REAL priority should be to learn how to apply them. Watching my team’s creative confidence increase exponentially. The more work we do, the more we’ve learned that we have all the talent, instinct and passion we need right in our four walls. We’ve unlocked some incredible storytelling leaders over the past few years (many of whom would have previously sworn up and down that they “weren’t creative”). Building a truly healthy work culture where people can bring their “whole selves” into the office every day. In my experience, it’s then—and only then—where breakthrough work happens. Are you looking to join a company where you can bring your whole self to work? Click here to check out open jobs at Athleta. And follow Athleta on LinkedIn for news and more opportunities.